Clothes Valet Stand Features: A solid hardwood texture with a Espresso finish. Equipped with: A trouser hanger bar Jacket hanger 3 chrome shoe bars Tie and belt hanger A tray organizer Product Description: Suit yourself with a stylish yet elegant looking mahogany valet stand .The valet is designed to keep your clothes well organized, wrinkle-free, and ready to wear. Your suit and its trousers have a perfect hanging place. Belts or ties have on-the-go tie holders.2 pairs of shoes fit on the chrome shoe bar. It includes accessory tray for wallets, spare change, watches and jewelry. 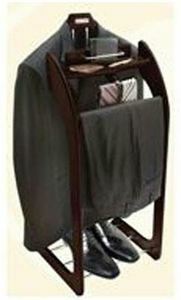 The valet stand is a perfect gift for him.